Happy Thanksgiving from the Public School Forum! The Friday Report will be back on November 30th after the Thanksgiving holiday. The North Carolina Channel can be found on Time Warner Cable/Spectrum Channel 1276 or check your local listings and other providers here. On Wednesday, January 23, 2019, the Forum will host our 5th Annual Eggs and Issues Breakfast. Each year the Forum unveils the Top Ten Issues in Education at the breakfast. 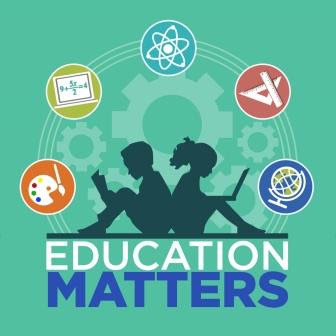 This event is one of the most anticipated education events of the year with a sellout crowd of 225+policymakers, teachers, principals, higher education representatives and members of the General Assembly. The event provides a platform to debut the newest release of the Top Ten Education Issues publication and includes a presentation of the issues by Forum staff. The Top Ten Issues publication highlights critical issues that will receive attention and drive policy debate during the upcoming legislative session. Individual tickets on sale soon. Sponsorship info available here. On Wednesday, May 16, 2018, the opening day of the legislative session, educators and their supporters from across the state traveled to Raleigh to demand more funding for public education. Photo Credit: Julia Wall, The News & Observer. “Remember, remember, we vote in November!” teachers shouted in May as they marched on the streets of Raleigh and in the General Assembly’s gallery, drowning out state lawmakers as they opened the legislative session. Organizers of the historic May 16 teachers march in Raleigh say the words of the protesters became reality this week when North Carolina voters elected enough Democrats to break the Republican supermajority in the state legislature. Hui, K. “NC teachers warned, ‘we vote in November.’ And they did, helping break GOP supermajority.” The News & Observer. 11/9/18. The cafeteria at Isenberg Elementary school. Salisbury, North Carolina. 10/18/18. Photo Credit: Jon C. Lakey, Salisbury Post. While communities and politicians tout test scores and school performance grades as the be-all and end-all, educators have long argued that the system has a fundamental flaw. School performance grades, they say, are more an indication of student poverty levels than achievement. It’s a correlation that’s been confirmed in study after study, and by organizations such as the National Center for Education Statistics. And the link is just as present in Rowan County as it is elsewhere. ​Rider, R. “School performance grades linked to poverty.” Salisbury Post. 9/11/18. Voters Widely Support Public Schools So Why Is It So Hard to Pay for Them? University Park Baptist Church on Beatties Ford Road has hosted Lake Norman Charter School’s graduation ceremonies for seven years. Photo Credit: Ann Doss Helms, The Charlotte Observer. 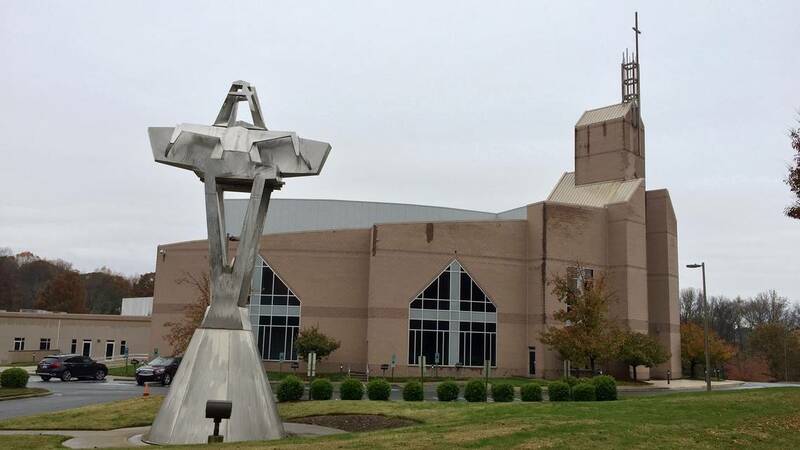 Lake Norman Charter School, one of the biggest and oldest charter schools in the Charlotte region, is scrambling to find a site for its 2019 graduation after an advocacy group challenged its longstanding arrangement with a church. For the last seven years, the Huntersville charter school has hosted its commencement ceremony at University Park Baptist Church in north Charlotte. Americans United for Separation of Church and State, an advocacy group based in Washington, D.C., challenged that arrangement after someone complained about seeing banners sporting Bible verses at the 2018 ceremony. Doss Helms, A. “Church-state challenge forces Huntersville charter school to find new graduation site.” The Charlotte Observer. 11/12/18. Satana Deberry is set to become Durham County’s district attorney in January after winning the Democratic primary with no Republican opponent on the ballot this fall. Photo Credit: Virginia Bridges, The Herald Sun. She hasn’t been sworn into office yet, but Durham County’s next district attorney is already talking about bold changes that she hopes will disrupt the school-to-prison pipeline. Satana Deberry, who was elected this month on promises of progressive criminal justice reform, has said she does not want her office to prosecute misdemeanors or low-level felonies that originate in schools. That means students who get into a fight or are caught with a small amount of marijuana would avoid the formal court system. Bridges, V. “Durham’s next district attorney wants to stop prosecuting most students charged in school.” The Herald Sun. 11/14/18. Dr. Patrick C. Miller, Superintendent of Greene County Schools, was named the 2019 A. Craig Phillips North Carolina Superintendent of the Year at an awards presentation and reception held Tuesday, Nov. 13 at the Joseph S. Koury Convention Center in Greensboro. The award was given jointly by the North Carolina Association of School Administrators (NCASA), North Carolina School Superintendents’ Association (NCSSA) and the North Carolina School Boards Association (NCSBA). To continue reading the complete press release, click here. 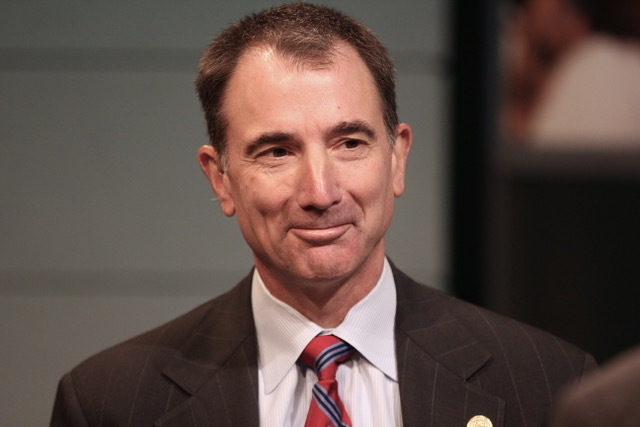 “Greene County’s Superintendent Named NC’s 2019 A. Craig Phillips Superintendent of the Year.” NC Association of School Administrators. 11/13/18. Beth Embree holds her plaque surrounded by, from far left, father Jack Embree, mother Jayne Embree, friend Roger Stout; second row, stepmother Holly Embree, St. Stephens principal Kathy Keane, counselor Liz Jaynes, Maria Ballard of Catawba County Schools, and Dr. Matt Stover, Superintendent of Catawba County Schools. Embree was honored last week as the School Counselor of the Year during a convention in Greensboro of the N.C. School Counselors Association. On hand were Mark Johnson, superintendent of the N.C. Board of Education, and Rebecca Atkins, chair of the N.C. School Counselors Association. Penkava, L. “Randolph County native named N.C. Counselor of the Year.” The Courier-Tribune. 11/12/18. Thousands of educators and their supporters in Colorado this spring protested low teacher pay and school funding. Photo Credit: Hugh Carey, Summit Daily News via Associated Press. If it were going to happen any year, it should have been this one. After a wave of teacher walkouts fired up people on both sides of the party line, the time seemed ripe for big investments in public schools. In reality, the results for school funding after the midterm elections last week were mixed, and illustrate a paradox in how Americans view education. Polls showed that the public supported the picketing teachers across the country who protested low pay and classroom funding. And a diverse group of candidates, Democratic and Republican, were elected after casting themselves as education champions. But many voters, particularly in conservative and swing states, were unwilling to open their wallets to send state tax dollars to educators and classrooms. Goldstein, D. “Voters Widely Support Public Schools. So Why Is It So Hard to Pay for Them?” The New York Times. 11/14/18. 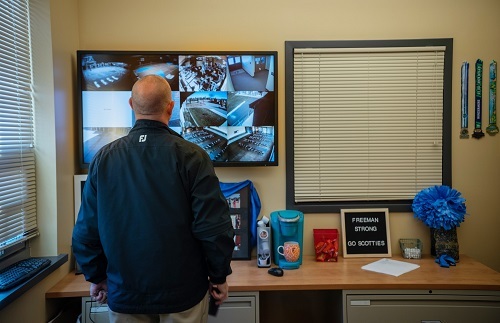 Superintendent Randy Russell checks camera feeds at Freeman High School in Rockford, Wash., which spent about $200,000 on new security after a deadly shooting last year. Photo Credit: Rajah Bose, The Washington Post. Billions are being spent to protect children from school shootings. Does any of it work? The expo had finally begun, and now hundreds of school administrators streamed into a sprawling, chandeliered ballroom where entrepreneurs awaited, each eager to explain why their product, above all others, was the one worth buying. Waiters in white button-downs poured glasses of chardonnay and served meatballs wrapped with bacon. In one corner, guests posed with colorful boas and silly hats at a photo booth as a band played Jimmy Buffett covers to the rhythm of a steel drum. For a moment, the festive summer scene, in a hotel 10 miles from Walt Disney World, masked what had brought them all there. This was the thriving business of campus safety, an industry fueled by an overwhelmingly American form of violence: school shootings. Woodrow Cox, J. and Rich, S. “Armored school doors, bulletproof whiteboards and secret snipers. ” The Washington Post. 11/13/18. Photo Credit: fzant, Getty Images. Blakemore, E. “Should Childhood Trauma Be Treated As A Public Health Crisis?” NPR. 11/9/18. 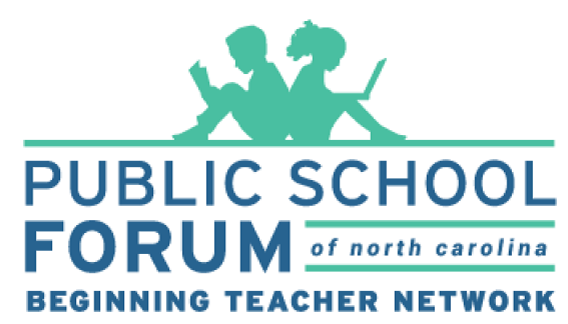 The Public School Forum of North Carolina is seeking a Policy Analyst. This individual will contribute to policy analysis and research efforts on a number of key educational issues in North Carolina. This position would be an excellent early career opportunity for an individual interested in education policy. Reports to the Senior Director of Policy. 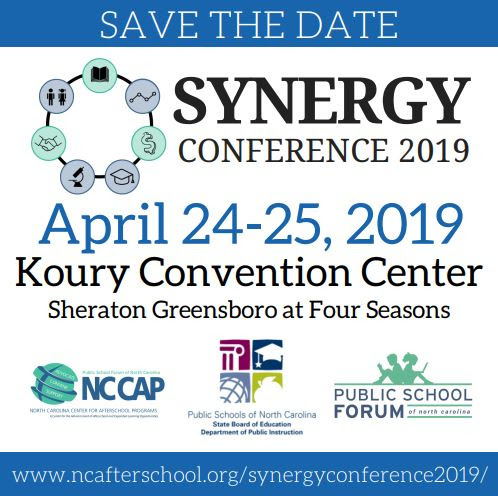 Monitor, document, and provide analysis of current education policy issues in North Carolina, with a focus on school finance, teacher pipeline, and education data systems. Conduct and interpret quantitative and qualitative research on K-12 education policy topics. Attend state legislative convenings and committee meetings. Contribute to the Forum’s communications efforts including op-eds and guest columns, newsletter articles and social media efforts addressing current policy issues and initiatives impacting education in North Carolina. To learn more about this position and how to apply, click here. Educators are invited to register to attend a “Summit on Student Safety and Wellbeing,” held Friday, Nov. 30, and Saturday, Dec. 1, in Chapel Hill. The event is free. Register online. Effective interventions aimed at making schools places of safety and health-promotion require solutions implemented at multiple levels. 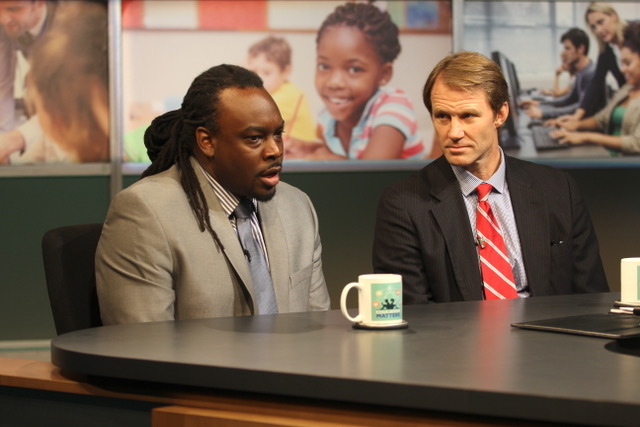 They require input from teachers, school counselors and psychologists, principals and assistant principals. Seating is limited, so we urge you to register. Click here to register. For more information on the program schedule, speakers and topics, visit http://studentsafety.web.unc.edu. This event will feature a discussion with Senior Associate Justice Paul Newby and Professor John V. Orth about how this important document was framed in accordance with the Reconstruction Acts after North Carolina was readmitted into the Union. This event will also feature ‘Constitutional Tales,’ a live, full production presentation, created by Ann McColl, an attorney practicing in the field of education law since 1991. Constitutional Tales is a multimedia presentation that uses actors to recreate debates and other important events about the 1868 Constitution of North Carolina and is adapted to the interests of judges, lawyers, historians, educators, students, advocates, legislators, and policy-makers. For more information, click here. Cost: Presentation is FREE and open to the public! NC Teaching Fellows applications are now open. All applications must be submitted online by 11:59 PM (EST) on Monday, January 7, 2019. Receive up to $4,125 per semester for up to eight semesters. Study at a premier educator preparation program in North Carolina. Benefit from meaningful program activities to enrich your studies. Teach in a Special Education or STEM field in a North Carolina public school. To learn more visit: https://myapps.northcarolina.edu/ncteachingfellows/ . A historic storm has devastated parts of North Carolina. In response, a historic, bipartisan coalition of current and former state education leaders presented their effort to aid schools to the State Board of Education, promoting Florence Aid to Students and Teachers (FAST NC) as a drive to help North Carolina’s public schools as students and educators struggle to return to normal. Hurricane Florence caused at least 1.2 million, or about 80 percent, of North Carolina’s public school students to miss some school. Many school buildings are damaged, and several school districts are still closed due to displacement, flooding and storm-related disruptions. Now, FAST NC has brought together an illustrious steering committee for the effort to help schools recover. 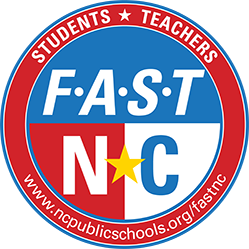 To learn more about FAST NC and how to donate, click here. The Biogen Foundation is inviting middle and high school students in Massachusetts and North Carolina to create videos on the topic of biotechnology in your life. These videos must be between thirty seconds and three minutes, accurate, and creative. We are accepting videos from September 14 through December 17. Work with a teacher at your school to submit your video (up to two submissions per school), because the first 200 schools to submit an eligible video will win $500! See spark.biogenfoundation.com for more information about the contest and to submit your video today! Submissions are open until December 17th. ALL NC schools are eligible to enter. Teachers MUST be the ones to submit the videos; students and parents are not allowed to submit videos. Questions? Contact the Biogen Foundation here. 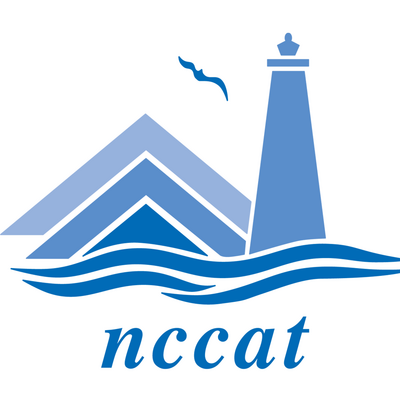 North Carolina educators have plenty of opportunities throughout the fall to attend the North Carolina Center for the Advancement of Teaching (NCCAT), a recognized national leader in professional development programming for teachers. Applicants are encouraged to register as soon as possible to ensure a spot. Programs are available to North Carolina educators at the Cullowhee and Ocracoke campuses, online and with NCCAT faculty visiting school districts. NCCAT provides food, lodging and programming. Teachers and or their districts are responsible for travel to and from the center and the cost of the substitute teacher. For a complete list of upcoming NCCAT programs, click here. For more information on how to apply for NCCAT programs, click here.